As an Official Travel Trade Partner of the Royal Edinburgh Military Tattoo we offer guaranteed Official tickets for all performances, offering spectacular views of the performance and fireworks. Standard packages include section 16 tickets and we also offer the option to upgrade to section 4 for a more central view and section 7 to face the Castle directly. We have a guaranteed allocation of Official tickets for the Royal Edinburgh Military Tattoo. After many years of being an Official Travel Trade partner all our seats have an excellent view. Standard packages traditionally include seats in SECTION 16 (or similar) but we do recommend a small upgrade to SECTION 4 (or similar) as a minimum. SECTION 4 (or similar) provide outstanding views of the performers as they emerge from the Castle gate, as well as the Castle itself, which will be on your right. Please note there are always steps to get to general seats and anyone with limited mobility is requested to get in touch with us prior to booking. Want to face the Castle directly and enjoy the precision of the military lines? Upgrade your ticket to SECTION 7 (or similar) for an additional £39 per person on top of the package price. Please note the Castle is located on a hill with a cobbled slope (above). The Royal Edinburgh Military Tattoo has facilities for wheelchair access at all performances and those with limited mobility. When booking please make us aware of any requirements you may have. Vehicular access to the Castle is limited but permits to drive to the Esplanade (weekdays only) are available on request. Want something extra special for your trip to Edinburgh? Ticket upgrades can also include Premier Seating and Hospitality Packages so you can be wined and dined in some of Edinburgh’s unique venues, including the Castle itself and the Scotch Whisky Experience, before your performance. These are subject to availability upon enquiry. In a fantastic central location, Mode’s stylish studios and apartments offer a kitchenette, work space, high speed wifi, Hypnos luxury bed and ample space as standard. Step outside the door and experience all that Edinburgh has to offer. Perfect for those looking for a bit more space and a more independant holiday whilst still being in the heart of the action. 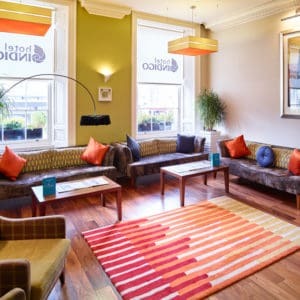 Located on St Andrew’s Square, just a short walk from Princes Street, this stylish hotel offers spacious and well designed rooms, as well as a complimentary 24 hour snack bar and tea/coffee, perfect for after a busy day exploring Edinburgh. Full of personality and charm, this is a wonderful hotel that is sure to delight. Rooms are bright and airy in a combination of fashionable colours, each telling the story behind the hotels original building, along with unique Scottish dialect throughout. If you’re looking for a centrally located hotel, look no further than Motel One. Located directly outside of Edinburgh Waverley Station and Waverley Bridge for buses to and from the Airport, the Motel One is less than a 10 minute walk to Edinburgh Castle, the Royal Mile and Princes Street, all of which boast unlimited choices for Fringe Festival shows, attractions such as Scotch Whisky Experience, Holyrood Palace, Mary Kings Close, as well as many great restaurants, shops and bars. Located in the heart of Edinburgh’s Old Town on the picturesque Cockburn Street, which was one of the streets in Edinburgh to inspire Harry Potter’s Diagon Alley, and home to many niche and unique shops. Within 5 minutes you could be shopping on Princes Street, or taking in the Festival atmosphere on the Royal Mile! 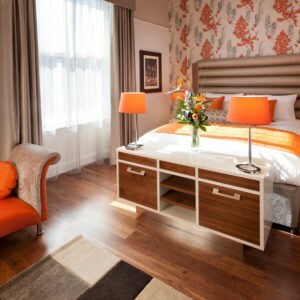 This boutique hotel is situated in a stunning A-listed Georgian terrace house in the heart of the City. A short 5 minute walk from Edinburgh Waverley Station and direct links to and from the Airport via the tram, which stops directly outside. Enjoy dinner in their stylist restaurant, or a drink and the sun in their private, heated outdoor terrace. Located a stone’s throw away from some Edinburgh Fringe Festival venues such as The Jam House and Stand Comedy Club and many great places to eat and drink, you’ll wish you stayed longer! Please note this hotel does not have an elevator, so may not be suitable for those with limited mobility. Scotland is world renowned for its whisky, and what a selection there is! Visit the Scotch Whisky Experience in Edinburgh for a perfect introduction to the world of whisky. This is a guided tour plus a nosing and tasting of a Scotch whisky (or soft drink) in The World’s Largest Collection of Scotch Whisky. It is an excellent addition to your Edinburgh experience and well worth the visit! A great way to explore the city, the Hop on Hop off bus tours offer a lovely way to view the main sites at your leisure. You have the choice of 3 different tours to take, and have 24 hours from when you first hop on to when the pass expires. Each tour is guided and visits a selection of the main areas in Edinburgh. Enjoy panoramic views from the top deck as you take in all Edinburgh has to offer. This unique ticket is all you need to explore the Royal splendours of Scotland’s capital. Valid for 48 hours, The Royal Edinburgh Ticket includes fast track admission to three majestic attractions in Scotland’s capital. Hop on – Hop off three Edinburgh Bus Tours as you explore the city between each attraction with panoramic views from the top deck. Explore Edinburgh’s sinsister side and gruesome past with tales of infamous murderers and cursed souls. With chilling tales from the past, visits to ghostly graveyards and a trip deep underground to the haunted Blair Street vaults, this is a tour like no other. Dare you venture on one?